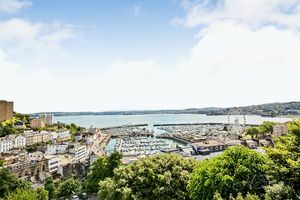 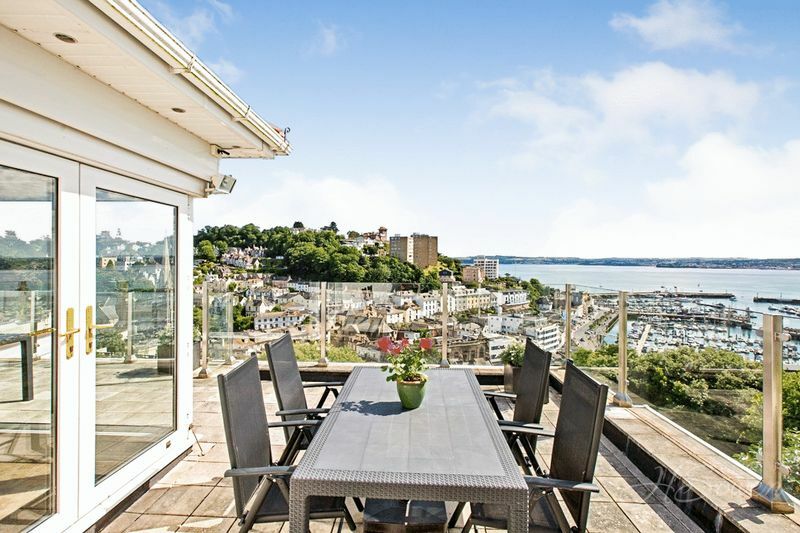 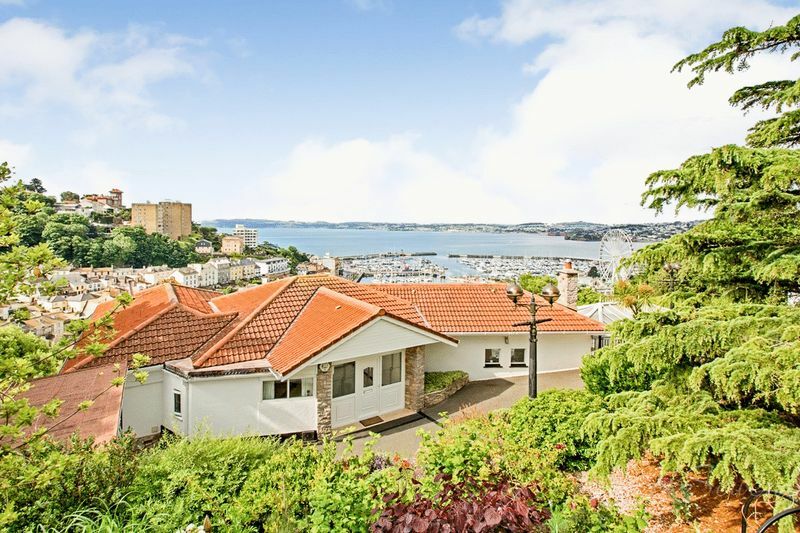 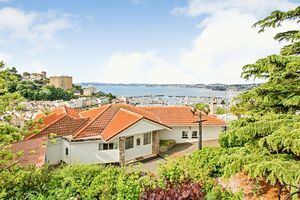 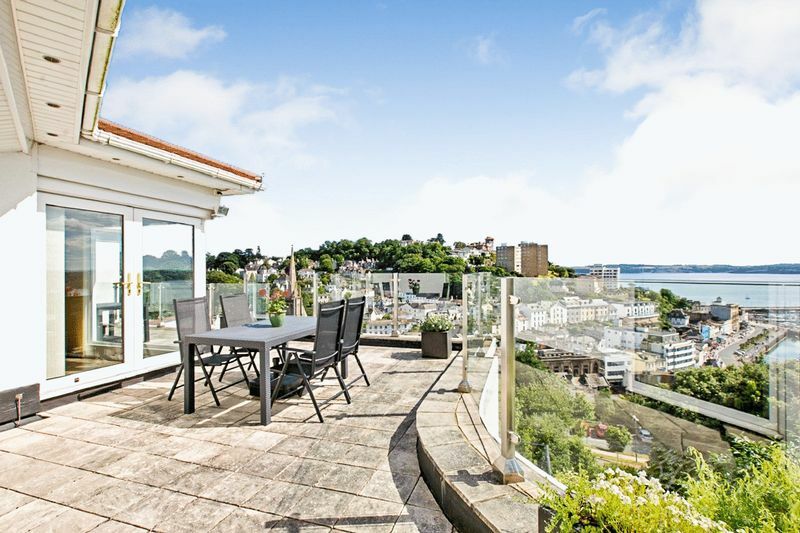 Set in a prominent elevated position above Torquay Harbour Side, Capello boasts an uncompromised expression of individuality with stunning architecture commanding superb Sea and Harbour views. 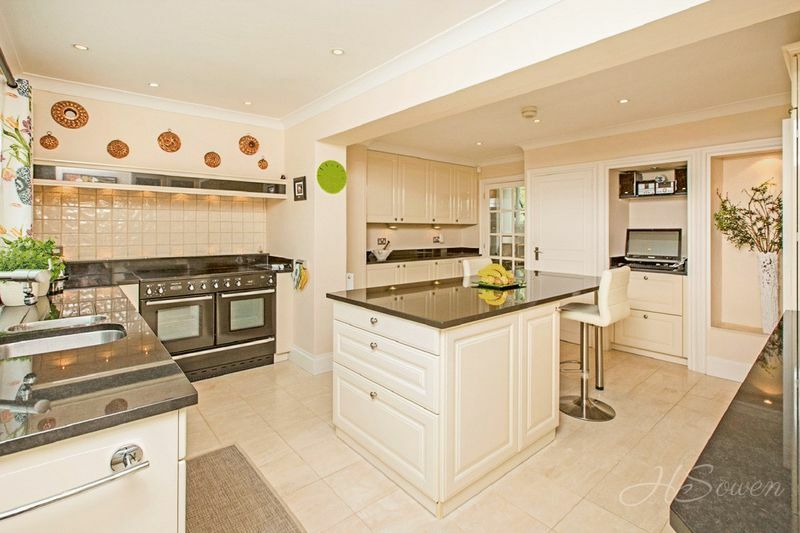 The property has been designed tastefully to provide four bedrooms, four reception rooms, three bathrooms, a kitchen, utility room and a conservatory. 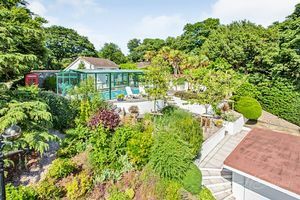 Offering a luxury living lifestyle the property also benefits from large sweeping driveway, a double garage and a covered swimming pool with pavilion. Making your way into the property, an entrance vestibule gives access into the hall leading to the principal rooms, a cloakroom and stairs rising to the lower floors. The kitchen is of an impressive size fitted with a modern range of units complimented by a central island with breakfast bar. 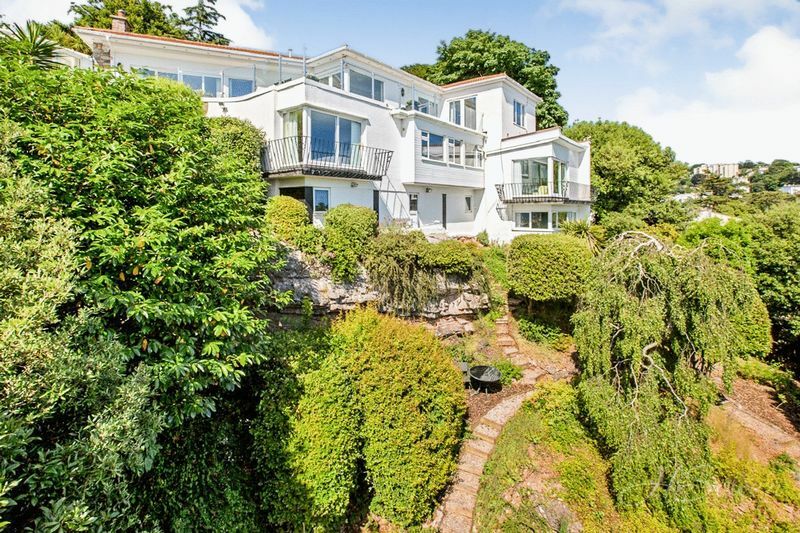 To the rear elevation you have the stunning views out to sea with the sink unit placed eloquently below the large window. Leading on from the kitchen you have a separate utility room and a breakfast room. 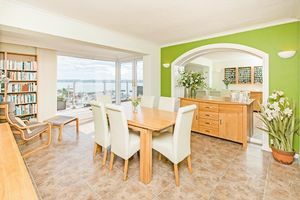 The breakfast room boasts again picturesque sea views and also benefits from double doors opening out onto a delightful sun terrace as well as underfloor heating. 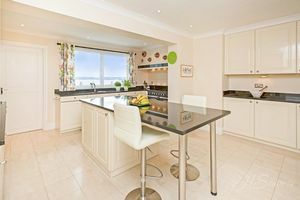 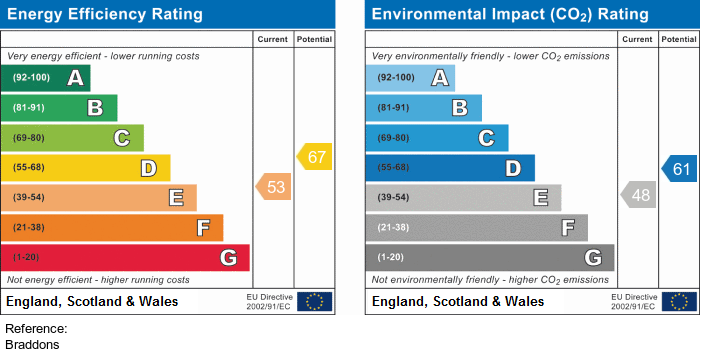 The breakfast room also provides access to the study, perfect as a home office or playroom if desired which again features underfloor heating. 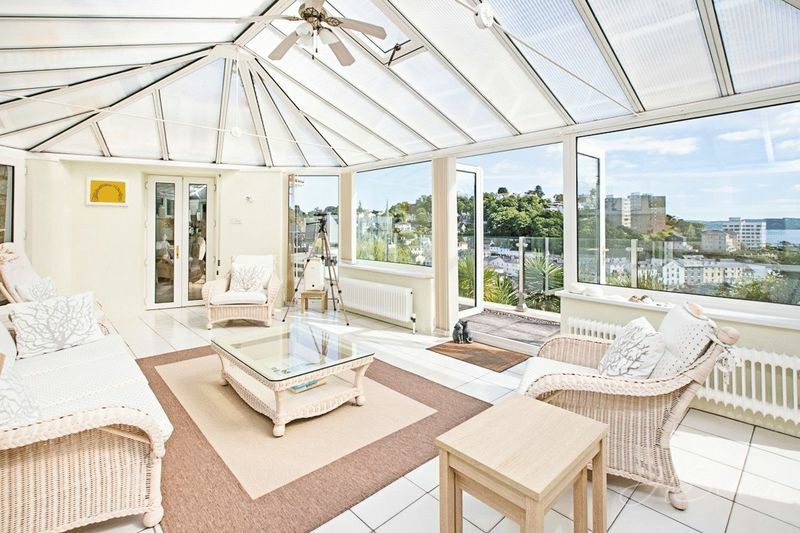 Back into the entrance hall double doors open up into the dining room providing an impressive amount of space to entertain guests with double doors leading out onto the sun terrace where you can enjoy the breath-taking views. 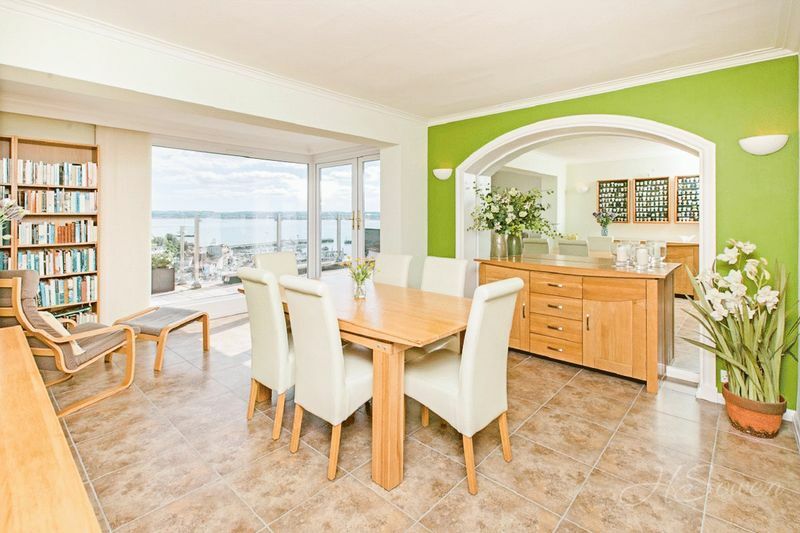 The dining room also benefits from under floor heating. Adjacent to the dining room you will find the living room, the true heart of the home. 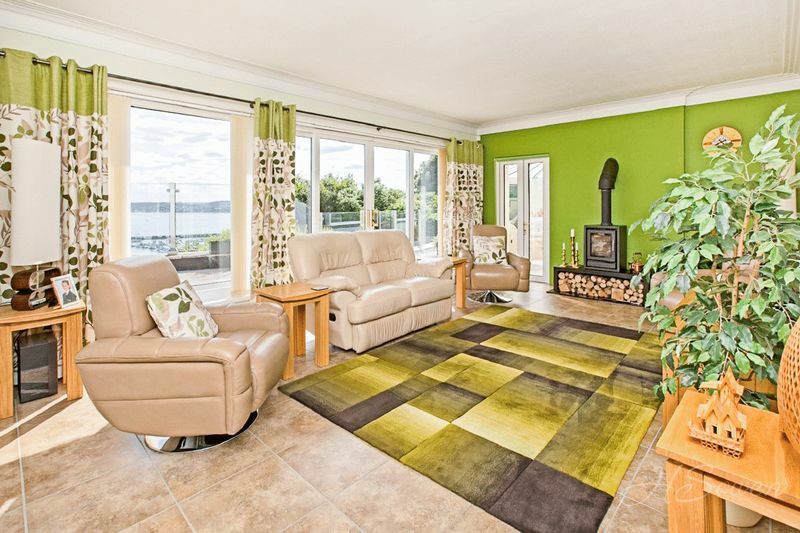 This room is generous in size yet has a warm ambience fitted with a wonderful log burner. The living room is wonderfully light with large double-glazed windows and French doors to the terrace capturing the sea views and allowing for a superb degree of natural light to flood the room. 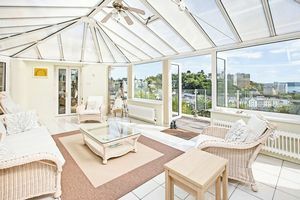 The living room then leads on to an impressive conservatory, beautifully bright offering flexible use as you desire. 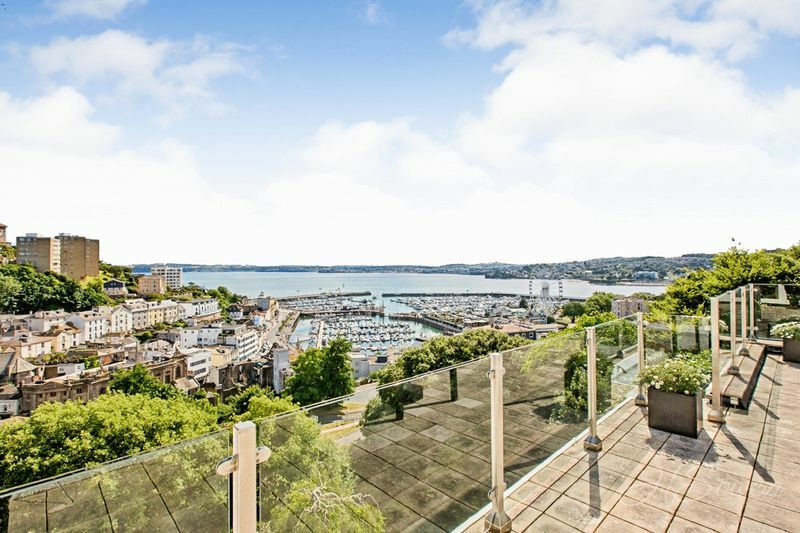 Taking the stairs, you will descend to the lower ground floor with access to three bedrooms, the family bathroom and stairs descending to the lower second floor. 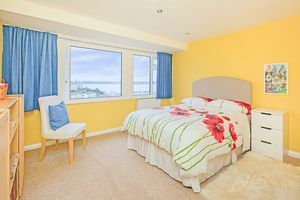 All three rooms are good-sized doubles boasting the stunning sea and harbour views. 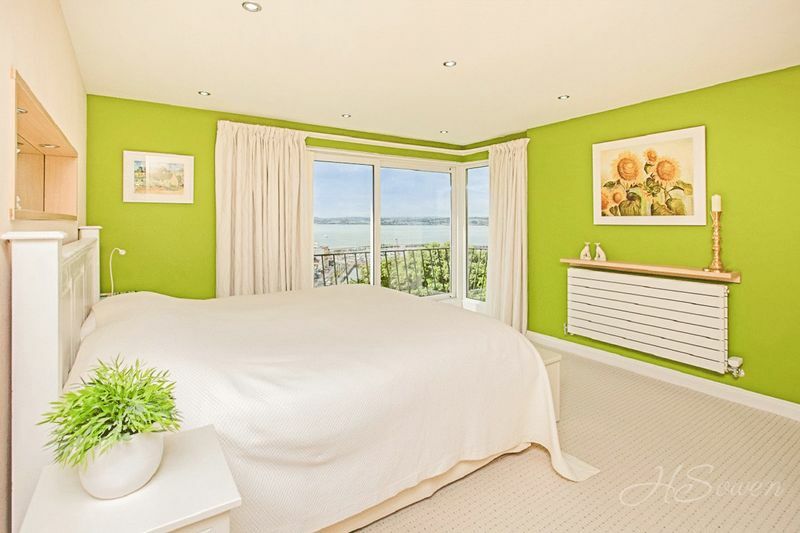 The master bedroom is wonderfully light with a dual aspect and doors leading out to a private balcony. 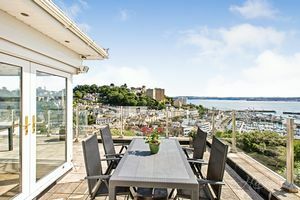 It is also fitted with a range of built-in wardrobes providing excellent storage space and boasts a truly stunning ensuite. 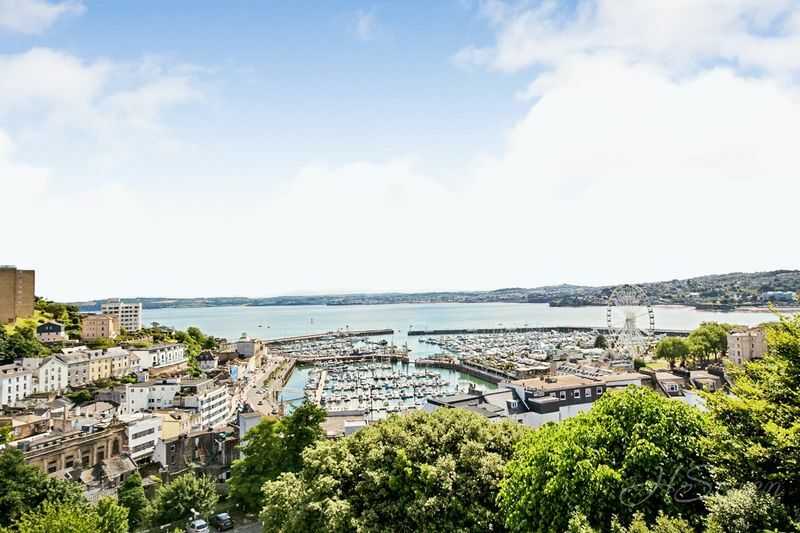 The ensuite is fitted with a double bath with central taps, a large walk-in shower, his & hers wash basins and a concealed cistern WC. The ensuite is fully tiled to the walls and floor and is finished with spotlights, under floor heating, illuminated recess shelving and a ladder style heated towel rail. Sea views can be enjoyed via a large double-glazed window from the bath tub creating a tranquil haven to relax in. 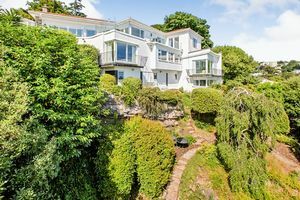 To the opposite end of the landing a few steps lead to bedroom two which also boasts direct access to a private balcony, sea views, a built-in wardrobe and ensuite facilities. 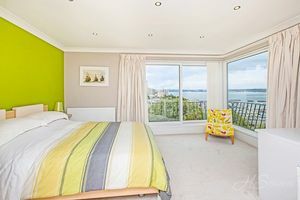 The ensuite comprises of a corner shower, a low-level WC and a wash hand basin set within a vanity unit, it also benefits from under floor heating. Bedroom three is a good-size double room boasting stunning sea views. 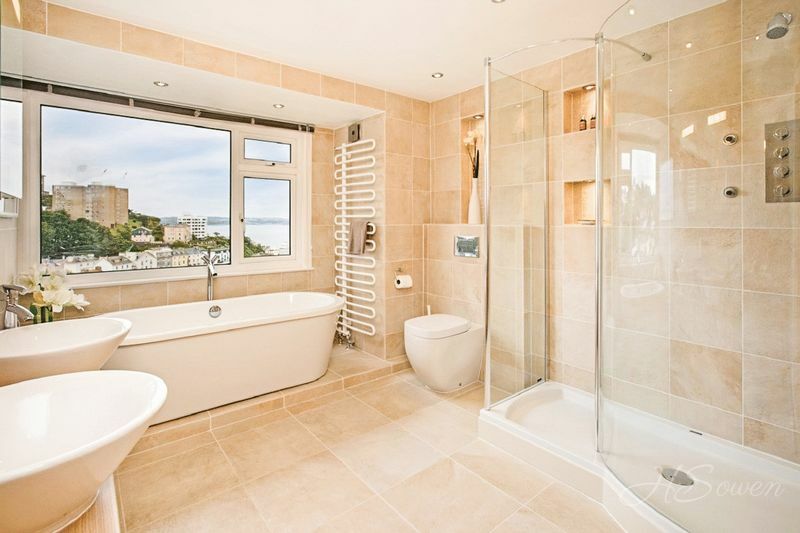 The family bathroom is of a high quality and is fitted with a corner shower, a low level WC, a wash hand basin and a bath. 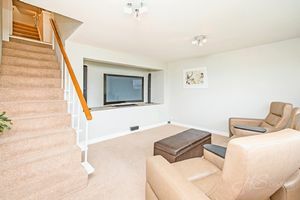 Taking the stairs, you will descend further to the lower second floor giving access to a fourth bedroom, currently arranged as a cinema room. 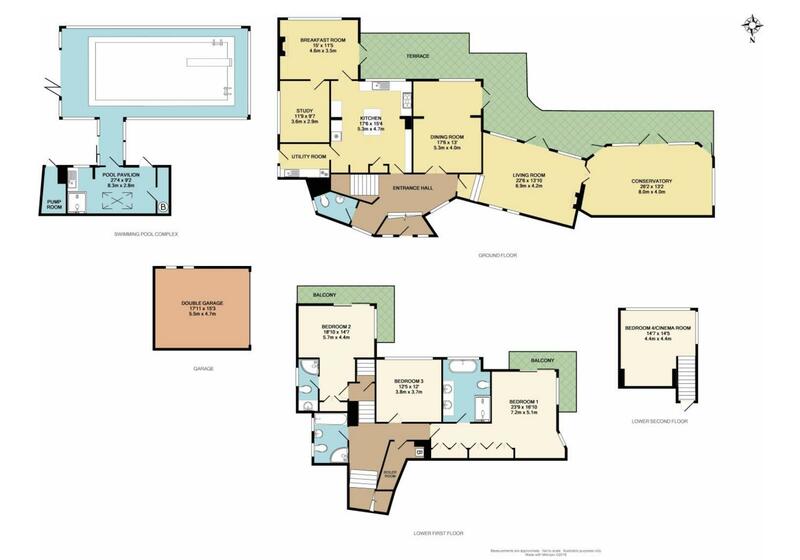 This room offers flexible use as desired and is light and bright by way of a dual aspect to the rear and side elevations. 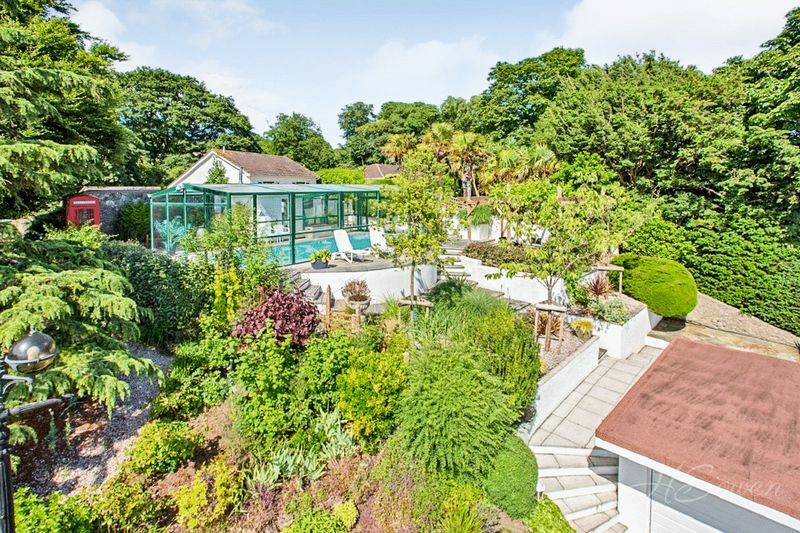 The property occupies a substantial sized plot with a large sweeping driveway providing an abundance of off road parking leading to the detached double garage. 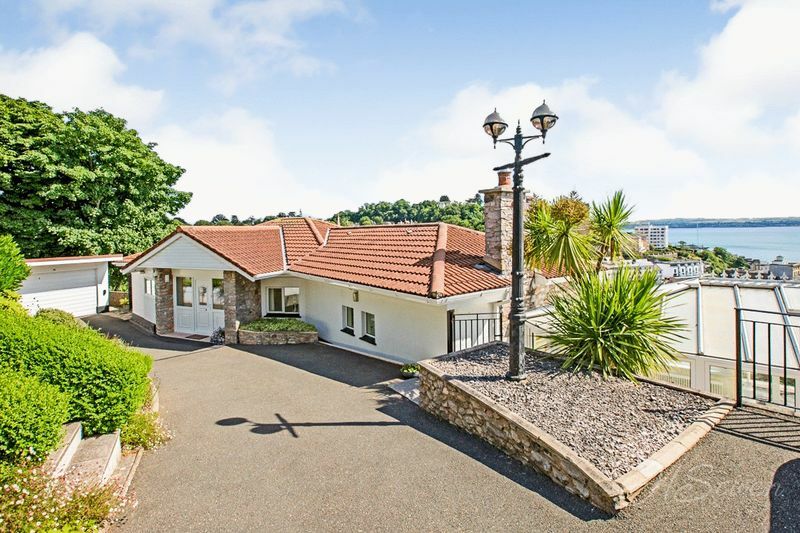 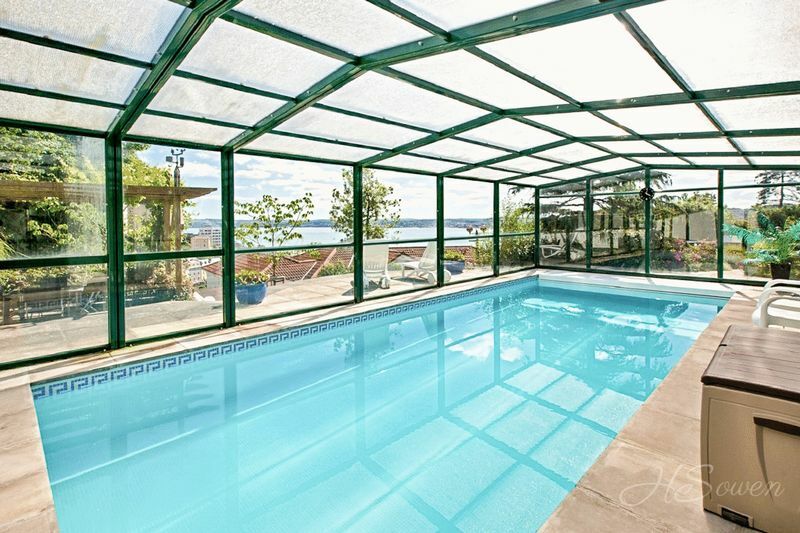 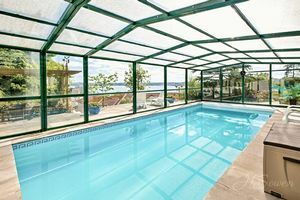 From here you have access to delightful landscaped gardens leading to a covered heated swimming pool with sea views and a pavilion providing shower and changing facilities. 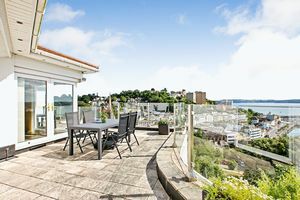 Gardens to the seaward side of the property have been landscaped and terraced for ease of maintenance, with the wonderful sun terrace with glass balustrades leading from principal rooms providing excellent outside space to enjoy the sea views.